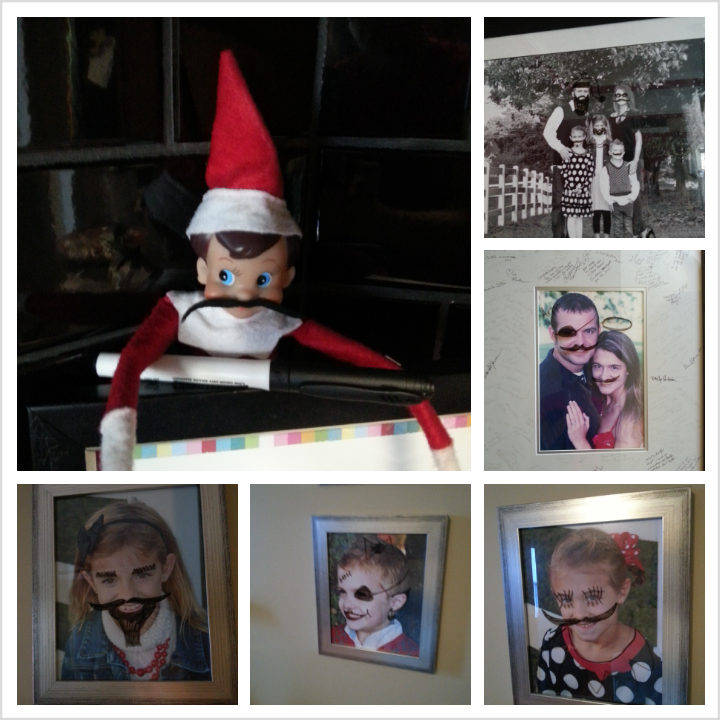 Keeping Up With The Joneses: Christmas Kick Off! Can you believe that Christmas has come and gone? The entire month of December was jam packed with Christmas fun. Throw in a side of kidney stones and other illnesses and that pretty much sums up our month. This year we did a few do for others type activities with the kids. We adopted a Caring Christmas Child through our church to buy gifts for. I explained to the kids that this boy and his family were having a tough time buying gifts this year. I think knowing that this boy was from our own community helped them realize how important it is to help and give to others. The kids came shopping with me and together we picked out all the gifts for the little boy we choose. He was the same age and had the same likes as Bryce so I knew he was the boy for us. I wish I could have seen his face when he received his gifts! The kids and I had a lot of fun doing this together. 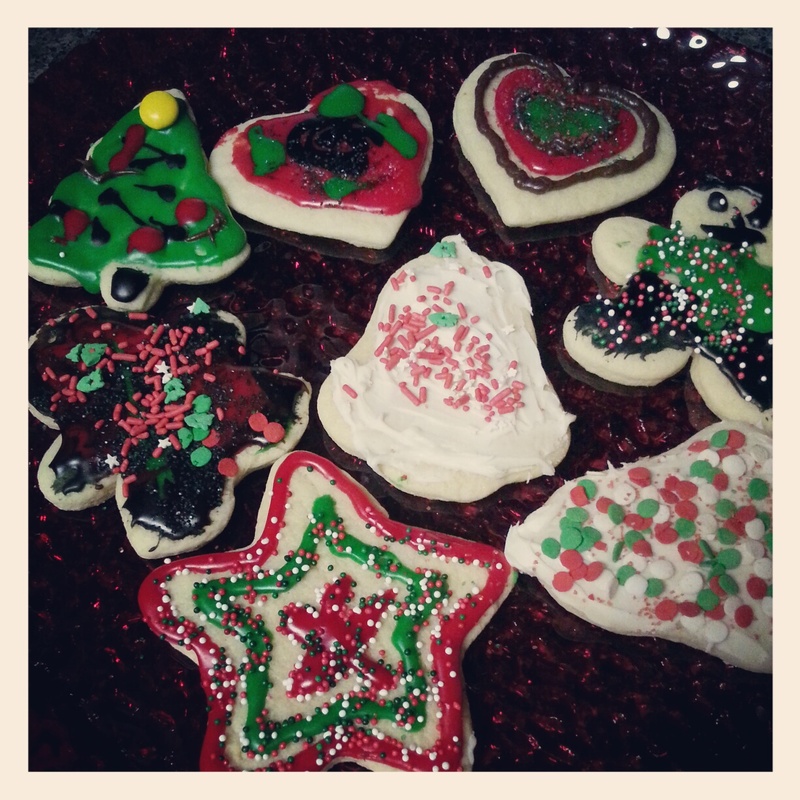 We made yummy treats for all of our neighbors. We made fudge, 2 types of cookies, "reindeer poop", and cake pops. 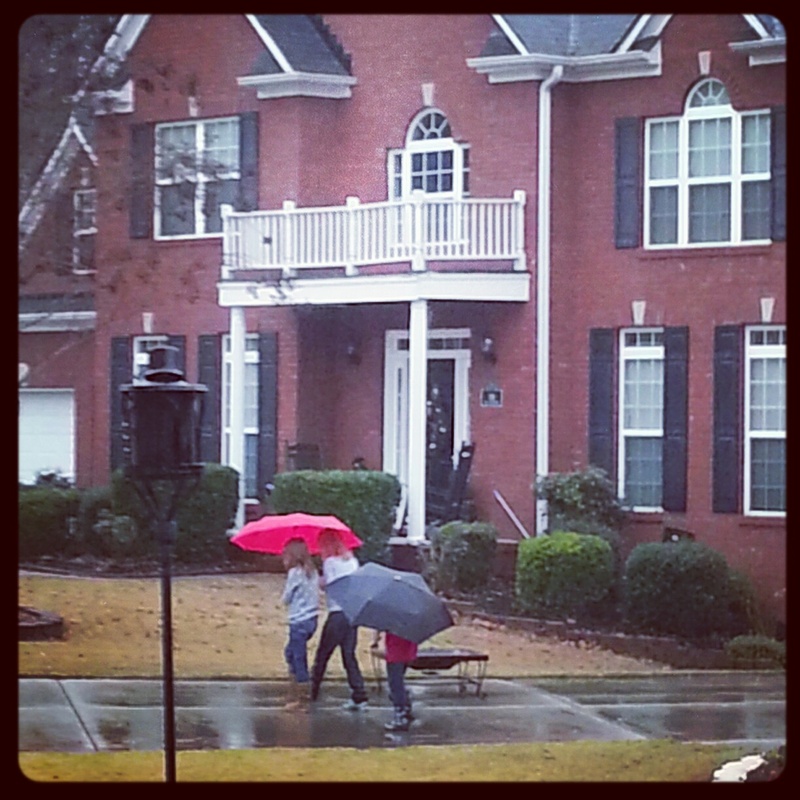 The kids lost interest in this project half way through, but they had a lot of fun delivering the packages to all the neighbors in the rain. Each of the kids made a card for our trash guys and our mail carrier. We gave the cards and a sweet treat to our community helpers to let them know we appreciate them. (We have a very sweet mail lady!) I really wish I had taken pictures of the cards because they were fantastic. We also did our annual drive about to look at Christmas lights, but this year we decided to leave a note attached to a candy cane at all of our favorite decorated houses. 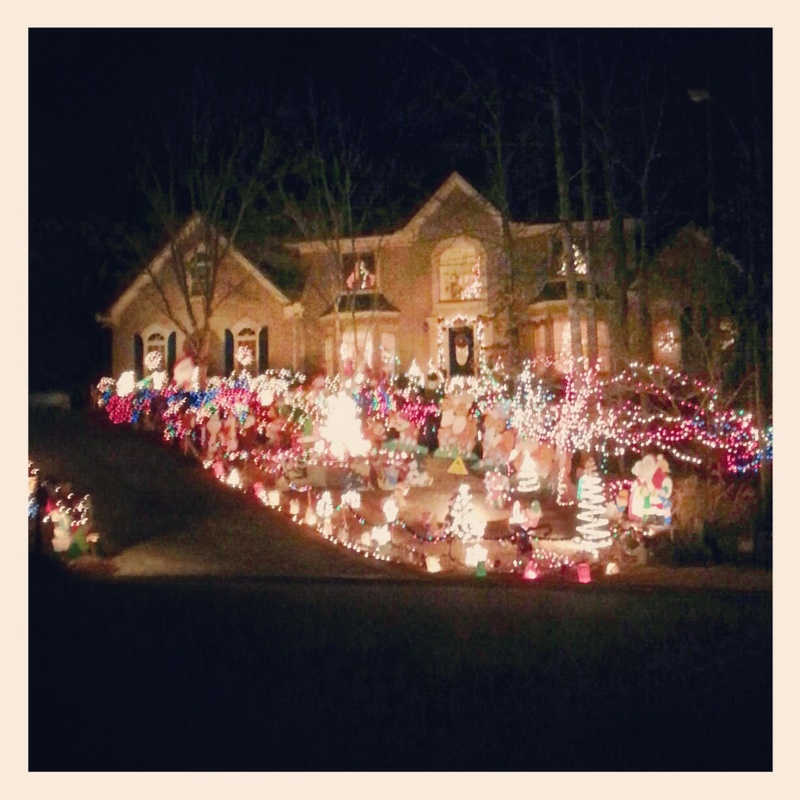 One side of the note had a poem about the candy cane and how it relates to Jesus and on the other side was a hand written note letting the home owners know how much we enjoyed their lights. Our favorite of the night. Picture doesn't do it justice. It was pretty awesome. The week leading up to Christmas was very busy. First up we had a Christmas program at Bryce's preschool. This is a very cute presentation of The Christmas Story. Bryce had a VERY important part in the program. Family and friends...I present Bryce the Camel. Out of the 3 camels he was by far the most energetic AND the cutest. Singing "We Wish You A Merry Christmas"
The girls had parties as school on the Friday before break. I totally forgot to take a picture of Sydney in her class because I was helping make snowmen ornaments, but I got one of Jordyn. This was a little bit of a sad day for the girls as it was their last day at Cherokee Charter Academy. We decided to pull the girls from the school and enroll them at the school our neighborhood feeds into. The drive to and from CCA was wearing me down and honestly...nothing about the school totally blew me away. I think the charter school has the same issues as any other school. My mommy gut is telling me we have made the right decision. 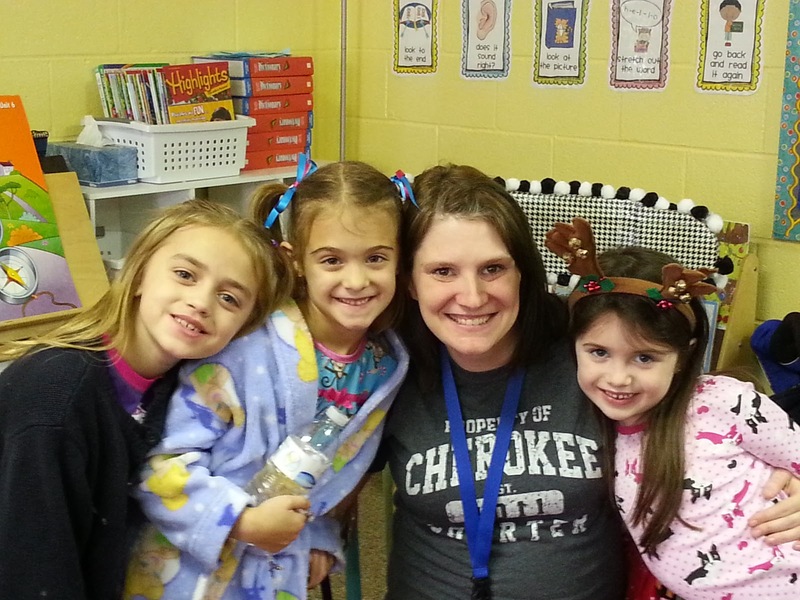 Jordyn with her friends and her teacher, Mrs. Roberts. Mrs. Roberts is awesome and we will really really miss her. a little boy on the way! After the school celebrations we had our first family Christmas celebration at my mom's house with her side of the family. The kids put on a show for us. On top of serenading us with Christmas carols they also wore costumes! Three very pretty little ladies started things off. He does a good "Ho Ho Ho". Singing Happy Birthday to Jesus. 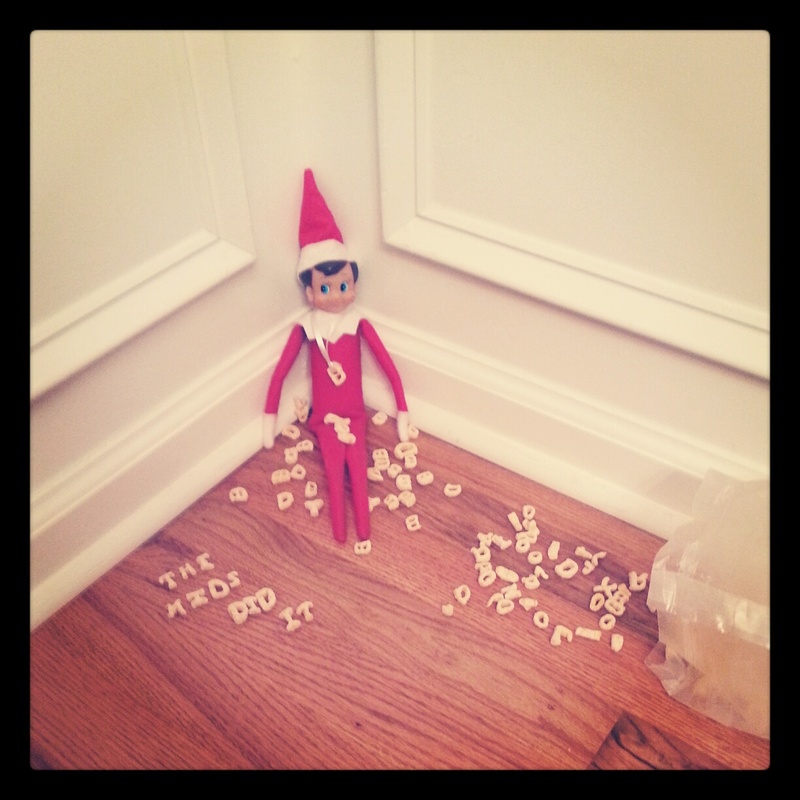 Before I wrap up this post enjoy some of the antics our elf, Buddy go into this year. Yes, I'm a nerd and took pictures of all his mischief. on the main floor of the house. And I do mean ALL of them. Made a mess with cereal and blamed it on the kids. He crate papered all the entrances to the kitchen and the doors to the kids bedrooms. This plan backfired on Buddy because Bryce got up to go potty in the middle of the night and started crying because he thought there were spiderwebs on his door. Woops! Buddy wanted in on the carpool fun so he spent one day riding around in the car with us. He even has on a scarf! Bath time. He wrote on the mirror with toothpaste - Be good, brush your teeth and love Jesus. Thanks Buddy for that mess because dried toothpaste was really hard to get off the mirror! Super Buddy! Turn on the fan and watch him go. and also hung up many pictures of himself. He clearly likes the dark haired princesses. Christmas Eve and Christmas Day posts coming soon. SO many pictures to go through!